Some years ago, a grade school teacher sent me Marilyn Nelson's Carver (2001), as a gift. I was finishing my graduate work and just getting started on my job teaching African American literature at SIUE. The grade school teacher, who's the mother of one of my friends, informed me that she had shared the book with some of her students, and they liked it. She was aware of my interest in black writers and African American culture and history, and decided to share the book with me. I'm really thankful that I received the book when and how I did. The collection of poems was presented to me as a book for young people, so as I read it, I often considered how grade school and middle school children might view the work. At the same time, Nelson's attention to historical detail throughout the work led me to view the book as helpful for adults, certainly this one, as well. Thus, I read and re-read Carver often thinking about the book in different contexts and communities of readers. As a book focusing on a single historical subject, I imagine Nelson's Carver was preparing me, in some ways, for my positive encounters with books such as Thylias Moss's Slave Moth (2004), Tyehimba Jess's Leadbelly (2005), and more recently Kevin Young's Ardency (2011). There were other connections as well. 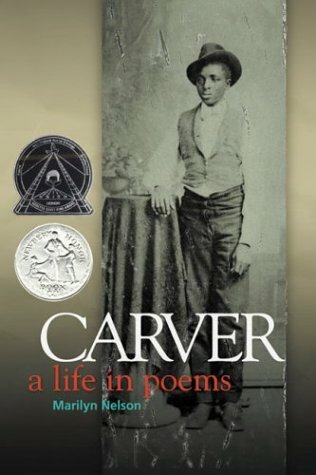 Carver was published around the same time as some other important volumes of poetry in my personal collection, including Lucille Clifton's Blessing the Boats (2000), Natasha Trethewey's Domestic Work (2000), Cornelius Eady's Brutal Imagination (2001), Kevin Young's To Repel Ghosts (2001), and Jayne Cortez's Jazz Fan Looks Back (2002), to name a few. The focus on African American and American history in Nelson's volume also gave it connections to a broad body of works by black poets from the modern and contemporary era such Amiri Baraka, Evie Shockley, A. Van Jordan, and Rita Dove and throughout literary history such as Robert Hayden, Margaret Walker, and Langston Hughes. For these reasons, when I sat down a few years ago and began to plan public humanities programs concentrating on poetry, George Washington Carver was on my mind, not simply because he had done so much with the peanut. Instead, I was very much aware of all that Nelson had done with Carver and verse. I was also mindful about how Nelson's book had come to me. The grade school teacher who sent me the book recommended it because she and her students had enjoyed it. In a way, they were inviting me into their reading community. That their community was rural, low income, and white was not important and at the same time notably important. They were sharing a part of their poetry library with me, and so, I wondered, how might I share my volumes of poetry with others? Just to be clear, I'm certain that my motivation and inspiration to begin expanding how the Black Studies Program approached humanities projects highlighting African American poetry have many origins. So I view Marilyn Nelson's book as one source--an important source no doubt--in our efforts to get moving. Her volume Carver was and remains one of our crucial connectors.